In this section I want to look at some buildings in Downton. I do not intend this to be a rambling description of the architecture nor a chronology of who lived there. Rather, I want to give you a feel for them and, as a way of looking at how we explore buildings, to consider why they are as they are and what was important to the people who built, altered and lived in them. Buildings are living artefacts that continually change as people’s needs change and this is often forgotten. Think of how houses you’ve lived in have changed from your grandparents’ or even parents’ time - and why? The White Horse illustrates two points when looking at buildings - context and status. 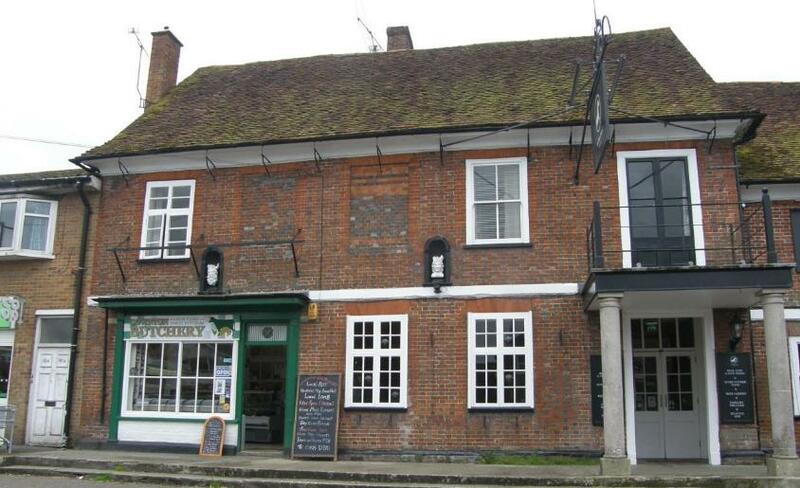 The White Horse dates back to the 15th Century and was subject to many changes over the centuries. You only have to look at it to see that it is well placed within the village and is an imposing building. Its position and size are important. Whenever you study buildings you must not look at them in isolation, as they are there, and in that form, for a reason. Some important questions are: what buildings are around them; what sort of settlement are they in (agricultural, industrial, rural, town); what is the geology (so building material available); what, and when, were the high and low points of the settlement (wealth, poverty)? In Downton, it was Bishop Roches in the thirteenth century who planned the development of Downton as a market town, where people could rent plots (Burgage plots) and have a right to vote and a say in the running of the town. So it started with high ideals. As you can see, the building was well placed on a cross roads of the Borough (Gravel Close and South Lane, having been more important roads in the past than they are now). Its size is also large in comparison with others in the village so it was clearly a very important, high status, building. This is certainly suggested by the evidence. 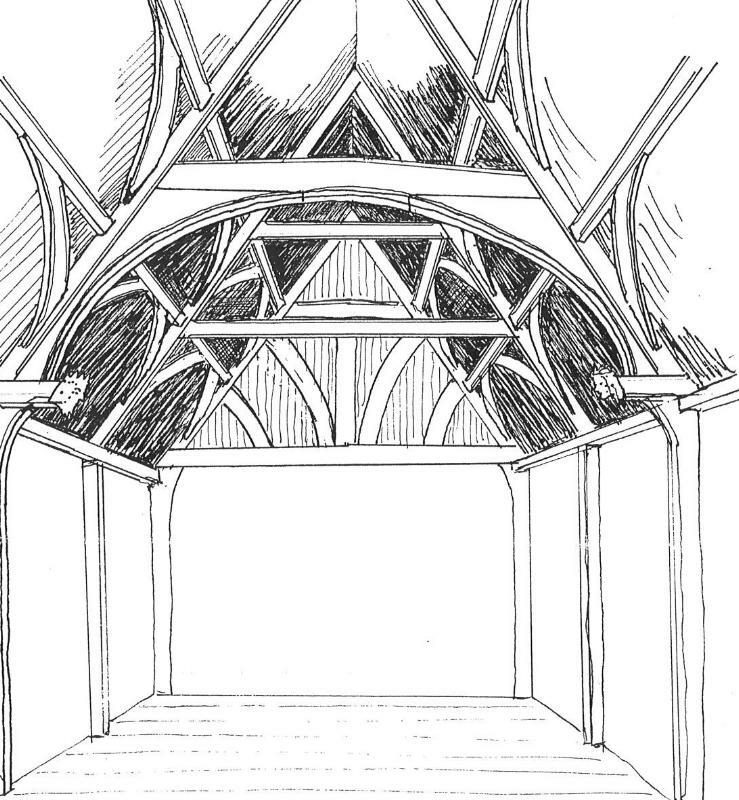 Look at the sketches of what it was like in the 15th century and look at the detail of the roof timbers in the photograph – and you can see this was no ordinary building. 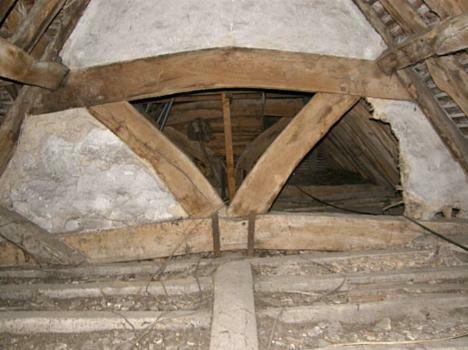 Indeed the roof that exists now is of the finest quality and early timbers are extremely well preserved. The building clearly changed its use throughout its life and was probably, at one stage, two separate buildings. It has been, variously, a public space (market, meeting place), a house and large hall open to the roof serving, at some time, a civic function. But, by the 1600s, it was an inn and has remained so to this day. The original timber walls were replaced, probably in the eighteenth century, by brick as timber tends to rot and those occupying the building then, like us, wanted to upgrade it. What survived is the roof – it was not visible from inside, so if it was sound, why replace it? In looking at old buildings the roof is often the key to the age of the building. In short, the White Horse Inn is a good example of the evolution of a building and illustrates why studying its context and structure helps us to understand its historical significance. Creel Cottage is situated on the north side of the Borough by the iron bridge. 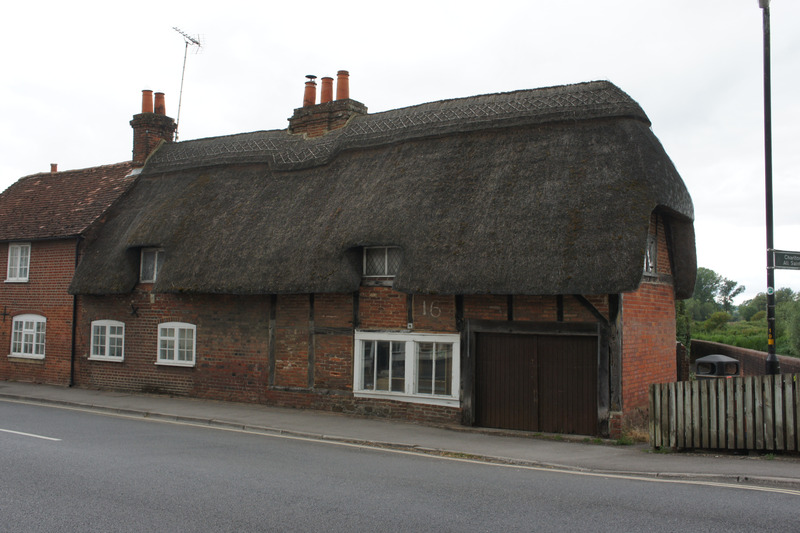 What you see today is largely eighteenth century and was at one time two cottages. I am interested in the part at the eastern end, next to the bridge, which has a carport in it giving access to a parking area at the rear of the house (the double brown doors in the picture) and the white windows. This ‘opening’ was created in the latter years of the 20th century by knocking out a room. The house was originally built in the Middle Ages when this part of it was a room open to the roof. In the centre of the room was a hearth supporting a fire and the smoke simply drifted up into the roof and through the thatch or out of some holes in the gable end. We know this because the timbers in the roof are smoke blackened. You will be aware of the great halls in castles where the more public aspects of life took place. Here, the Lord would both entertain and plan affairs of state; and although persons of all ranks would mix, hierarchy was still very strictly followed: for example, at meal times, important people were on a high table and lesser folks below. This status and use of the “hall” was reflected throughout the social scale and was still found in modest houses such as Creel Cottage where such rooms were open to the roof. Another important practical reason for rooms being open to the roof was the lack of a chimney; smoke had to go up through the roof as there was no alternative. By the sixteenth century, for a number of reasons, building styles were changing, but the critical factor was technology and, in this case, the ability to produce cheaper bricks. Bricks meant you could build chimneys and thus provide better warmth and controlled smoke. The open hall could also be floored-in to create more space – we all want an extra room. There was another stimulus in that there were a series of very severe cold spells. As people needed warmth and heating an open roof space was not a good idea. The nobility and upper classes also started to want privacy and did not wish to conduct all their business in public areas. This preference filtered down to the lesser nobility, yeomen and merchants. So, as well as practical reasons, we see the impact of shifts in culture and fashion determined by how people chose to live. At some stage in Creel Cottage, an upper floor was inserted. We know this because there are brackets on wall beams in the ground floor used to support an inserted floor, and beams supporting the roof have been altered to allow access along the first floor. None of this happened overnight. The rate of change varied according to the spread of fashion, technology and the availability of local craftsmen. So, while bricks may have been used in the great houses in the fifteenth century, it was probably not until the seventeenth that the flooring-in of open halls and the use of chimneys was widespread. Of course, at a local level in Downton, the availability of clay and sand meant bricks were probably in use early on, and continued to be produced locally up to the 1980’s. So, by looking at Creel Cottage, you can discern another important factor in the how and why of building development - and that is technology, driven by natural environment, weather and availability of raw materials. And, again, we see the influence of status and class - shaping fashion in building use and design .